Model : X DESI PERKINS HIGH KEY MINI. And now, the details that made #QUAYXDESI HIGH KEY an icon have been scaled to fit even more faces. HIGH KEY MINI Gold/Gold Mirror is HIGH KEY, but mini. 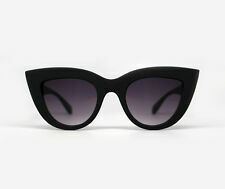 100% Authentic Quay Australia High Key Mini Black Fade Sunnies. Includes the original clear soft plastic Desi X storage case and a Quay Australia cleaning cloth. Featuring its signature triangular notches, unmistakable aviator shape, and flat lenses, HIGH KEY MINI is perfectly sized down for a more petite look. Width: 14.5cm - 5.7". 100% UV protection. AVIATOR SUNGLASSES. Not polarized. Our sunnies comply with Australian standards. High sun glare reduction. TOP QUALITY, AMAZING PRICE. Glass lens. HIGH KEY - Black/Fade (Limited Edition). 100% Authentic. with glasses clear case. NWT Quay Australia Drama By Day Unisex Lg.Rectangle Blk. Plastic Sunglasses. Free zipper case, cloth with purchase. Bring on the heat in these limited-edition oversized aviators designed in collaboration with Desi Perkins. SAHARA - BLACK/olive. 100% Authentic. Never use ! with Clear Sun glasses case. These oversized aviators feature a black metal frame, double bridge, and adjustable nose pads for no-slip wear. Retails at $60. 100% AUTHENTIC QUAY AUSTRALIA FRENCH KISS SUNGLASSES. Unapologetically romantic yet fierce, FRENCH KISS will pull any outfit together. I will respond you as soon as possible! Don't just throw these in the bottom of your bag. Quay 9343963015409 Vivienne High Key Aviator Sunglasses - Black BNWT. Condition is New with tags. Shipped with USPS First Class Package. Width: 145mm. Height: 56MM. Nose Gap: 18mm. QUAY Australia X Desi Perkins 'High Key' aviator sunglasses. QUAY AUSTRALIA DRAMA BY DAY SUNGLASSES Black Eye Frame AUTHENTIC. Condition is Pre-owned. Shipped with USPS First Class Package. Style: DRAMA BY DAY Color: Black Lens Color: Grey Gradient Indulge yourself in these spectacular sunglasses. Measurements: 54 mm x 15 mm x 150 mm Condition: Brand New QUAY AUSTRALIA TONY BIANCO Carrying Pouch & Lens Cleaning Cloth Included. NEW Quay Australia Black Aviator Style Sunglasses. We will reply as soon as possible within 24 hours. Width: 145mm. Height: 55mm. Polycarbonate Lens. Stainless Steel Hinges. New! Quay ICONIC sunnies in case . Condition is New with tags. Shipped with USPS First Class Package. Quay Australia High Key Aviator Sunglasses - Black. Condition is New with tags. Shipped with USPS First Class Package. Quay Bundle, Vivienne And My Girl, Condition is New with tags. Shipped with USPS First Class Package (2 to 3 business days). Quay 9343963015409 High Key Aviator Sunglasses - Black. Condition is New with tags. Shipped with USPS First Class Package. Quay Australia Vivienne Aviator Sunglasses - Black/Smoke, NEW with Case. Quay Australia Vivienne Aviator Sunglasses - Black/Smoke, NEW. From Fabfitfun Spring 2019 box. No tags but never worn, brand new. Perfect Condition. Soft case included. Shipped within US. USPS First Class Package. FabFitFun NWT QUAY AUSTRALIA Vivienne Sunglasses in Black/Smoke Free Shipping!! 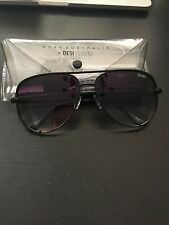 FabFitFun NWT QUAY AUSTRALIA Vivienne Sunglasses in Black/Smoke Free Shipping!!. Condition is New with tags. Shipped with USPS First Class Package. Quay Australia- High Key Aviator Sunglasses - All Black - Never used. Quay VIVIENNE Aviator Sunglasses - Black. Condition is New with tags. Shipped with USPS First Class Package. Keep it HIGH KEY. Designed in collaboration with Desi Perkins, this worldwide fan fave has turned the classic aviator on its head. Quay Australia Vivienne Black Aviator Sunglasses With Soft Case *NEW*. Condition is New with tags. Shipped with USPS First Class Package.